I am so happy to be back with you guys! If you’re wondering where I’ve been (and don’t follow me on Instagram…which if you don’t, what’s the hold up? ), I have been working on a REALLY exciting project at work. I can’t share too much right now, but I will make a big announcement as soon as I can. I decided since I haven’t posted in awhile, I should go with a crowd favorite – COOKIES! 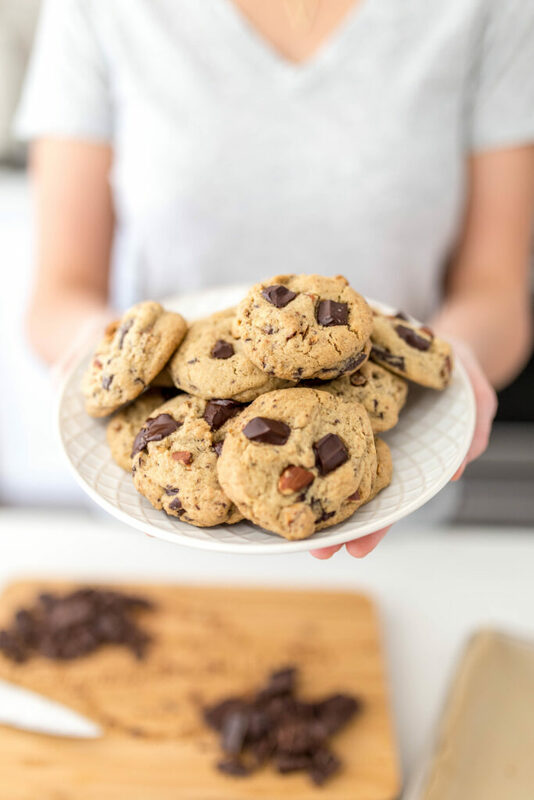 It has been ridiculously hot in Los Angeles, so the idea of turning on my oven right now sounds like torture, but I would do it just for these dark chocolate chunk almond cookies! Either that, or I’ll just eat all of the cookie dough. This recipe was actually inspired by one of my favorite cookies at Trader Joes. You know, the ones in the plastic tubs? They stare you down as you’re cruising the frozen vegetables and then magically jump into your cart? I don’t know how they do that. Anyway, there is a dark chocolate chunk almond cookie (stealing the name for this recipe, obviously) that is addicting. And I do mean, addicting. But, of course, homemade is always better. AND I wanted to make it gluten free. AND upgrade the ingredients. AND add flaky sea salt. In my humble, cookie-loving opinion, the key to a good chocolate chip cookie is the ratio of white to brown sugar. Brown sugar is really just regular sugar with molasses added, but that’s what adds the rich caramel flavor and moisture to your dough. Higher brown sugar in cookie dough will yield a chewier cookie. It is also important to note the importance of creaming your butter and sugar until it is light and fluffy. This takes minutes, not seconds. DO NOT skip this step. If cooking is an art, baking is a science. Every step is intended to illicit a reaction. Creaming together the butter and sugar not only helps combine the fat and sugars, it also adds tiny air pockets to the dough. These tiny air pockets expand during baking and give the cookie structure, or its crumb. The result is a light and chewy cookie rather than a dense one. I feel like I should figure out how to insert the NBC “The More You Know…” shooting star right here, for effect. Do you guys remember when they used to do that? In all seriousness, if you have any questions about cooking or baking…or anything really, send me an email, leave a comment, or find me on social media. 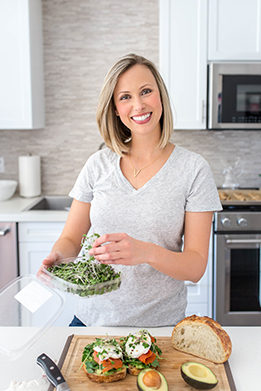 I am happy to walk you guys through any of my recipes or food conundrums! 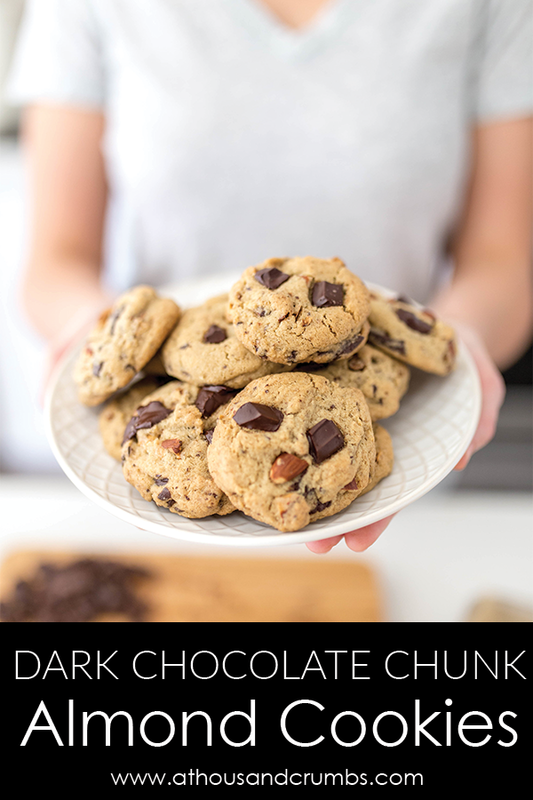 In the meantime, I’ll be over here eating all of these dark chocolate chunk almond cookies! 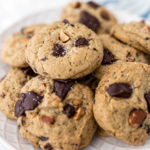 A chewy dark chocolate chunk cookie studded with chopped toasted almonds and lightly dusted with flaky sea salt. Preheat your oven to 350 degrees. Line two large baking sheets with parchment paper and set aside. In a large bowl, cream together the butter and sugars until light and fluffy. About 2 minutes. Add the beaten egg, vanilla, and beat well. Another 30-45 seconds. Add the flour mixture into the wet mixture, in thirds, beating well after each addition. Slowly stir in the chopped almonds and chocolate chunks. Using a medium cookie scoop, scoop dough in rounded tablespoonfuls onto the prepared cookie sheet. Sprinkle lightly with sea salt. 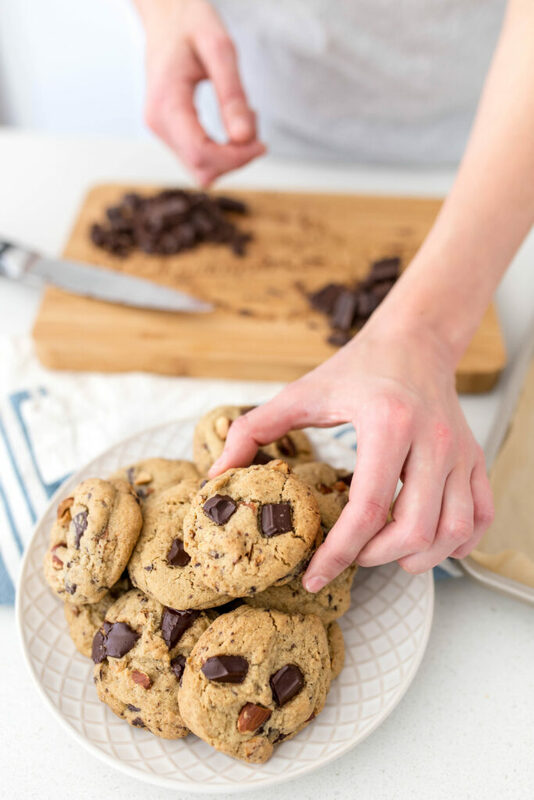 Bake for 8-10 minutes for a soft, chewy cookie, or bake for an extra 1-2 minutes for a crispier cookie. 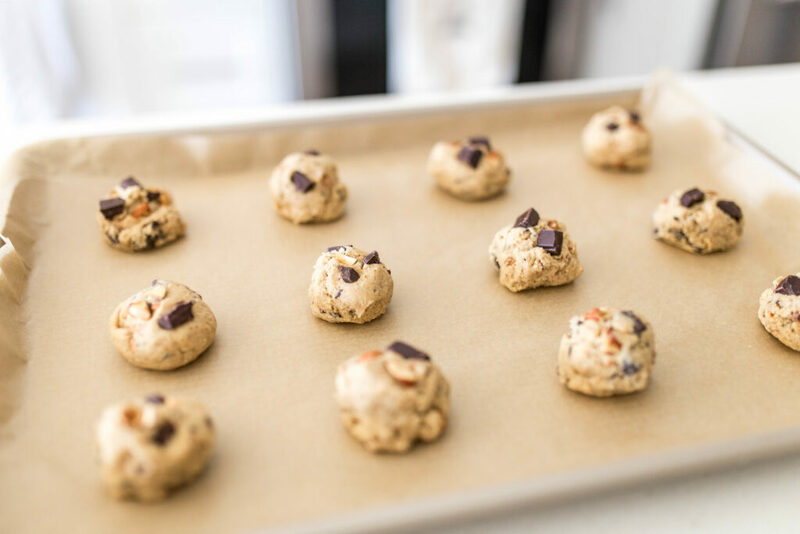 Allow cooked cookies to cool on the baking sheet for 5 minutes before transferring to a wire rack to cool completely. To toast the almonds, roast raw almonds on a baking sheet at 350 degrees until fragrant and lightly toasted. About 5-10 minutes. Raw cookie dough balls can be frozen in an airtight container. Add 1-2 minutes to the baking time if baking from frozen.